Control and Monitor all Recorder and Player instances in the system. Connect to local and remote nodes. Monitor RnR Service status (scenarios, storages and services). Import and export recorded data. Query and edit recorded data. 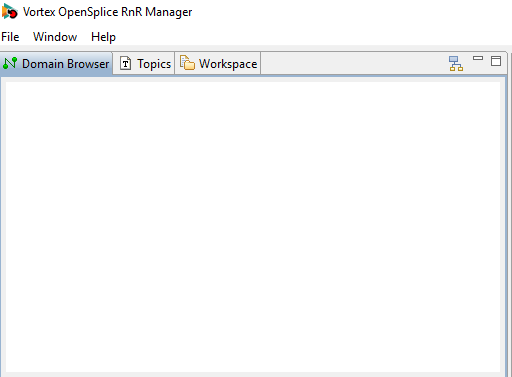 The RnR manager is available as a separate download and you will need to install it separately from Vortex OpenSplice. 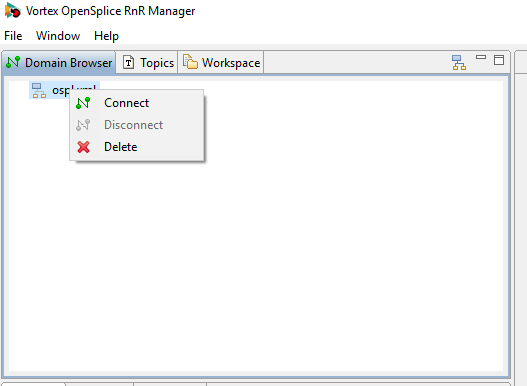 Before using the RnR manager you need to configure OpenSplice to use the Record and Replay service. The RnR Service is a pluggable service that comes with Vortex OpenSplice. The RnR manager can be started using the startRnRManager script. This is found in the eclipse directory of the RnR Manager install directory. Using the script will ensure that all the environment variables are set correctly. If you are using windows the RnR Manager can also be started from the start menu. This will bring up the RnR Manager window. The RnR Manager will pick up the OSPL_HOME value from environment. If this variable has not been set in the environment it can be set explicitly in the RnR Manager. To do this go to menu, choose Window > Preferences. 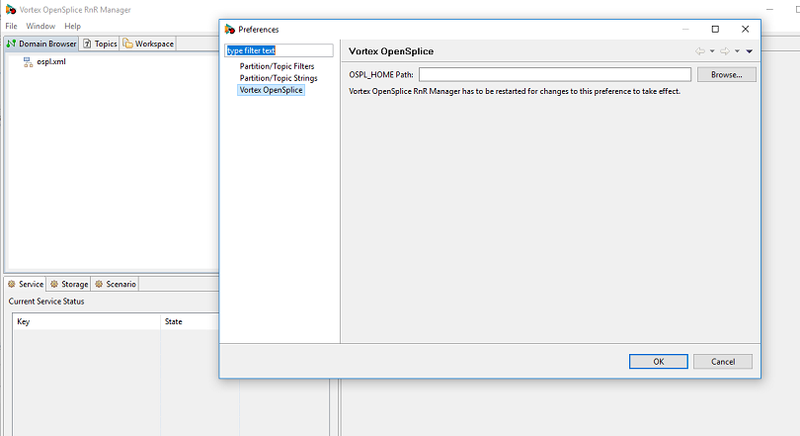 In the preferences window click on Vortex OpenSplice. 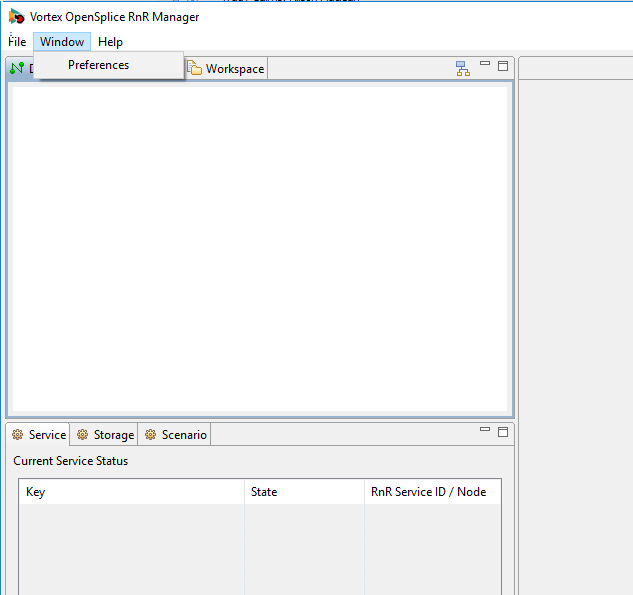 This gives you the option to set the OSPL_HOME path. You can browse to the directory you wish to set this value to. The top left tab of the RnR Manager shows the Domain Browser. This is used to define and connect to a domain. It also provides information about the domain. To add a domain you need to press the Add Domain button in the top right corner. 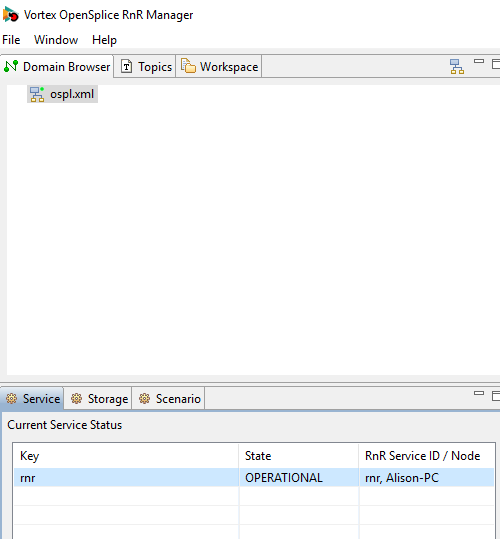 This will bring up a window that asks if you want to add a local domain or a remote domain. To add a local domain you can use the xml file or specify the doman id. To add a remote domain you can use the node URL. Enter the value, press okay and the domain will appear in the domain browser. One you have added the domain you will see it appear in the Domain Browser. To connect to the domain double click on it or right click and choose connect from the menu. You should now see the RnR service as a listing in the Service window below the Domain Browser. 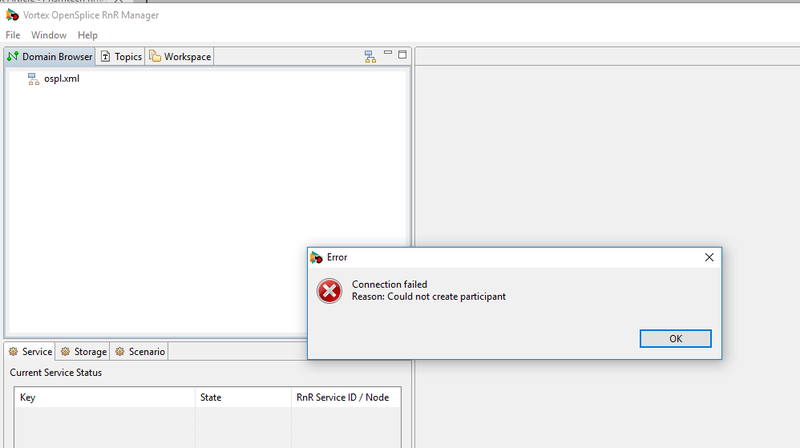 If you are using shared memory configuration you may see the error: “Connection failed Reason: Could not create participant” when connecting to the RnR Service. This address must be the same for each process communicating within a domain. The possible values are platform dependent. It is useful to use a Memory Mapper to help select the value for the memory address.